Farming Friends & TopVeg have collaborated to create a How To Grow Borage card. 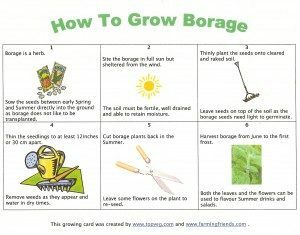 If you would like a pdf of the grow card for How to Grow borage, please complete the contact form asking for the grow card for borage and we will email it to you. Borage is included in the How to Grow Culinary Herbs eBook written by TopVeg & Farming Friends which costs £4.